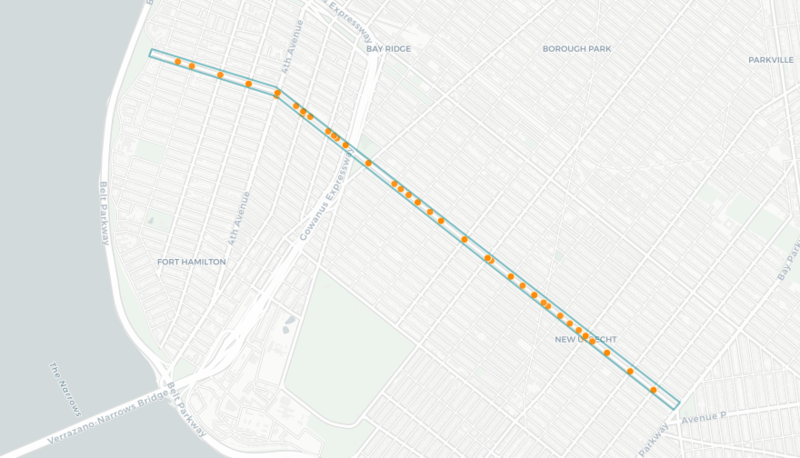 A long-sought bike lane on Bay Ridge Parkway may be back on the drawing board nearly a decade after it was unceremoniously buried by Brooklyn’s Community Board 10 — but more ambitious street safety improvements seem to be off the table. 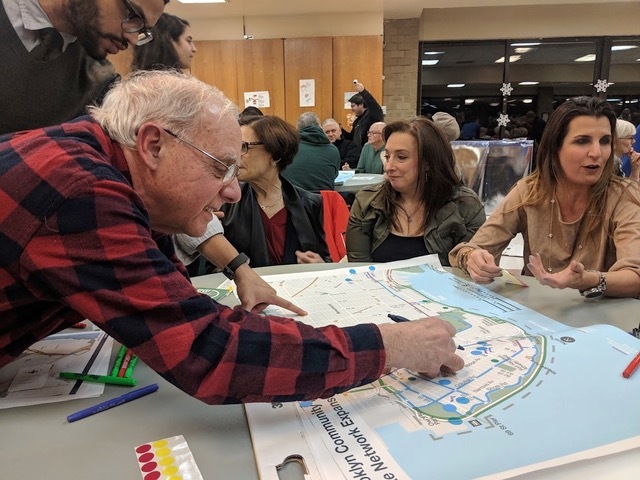 At a Department of Transportation-sponsored workshop last week, five out of seven groups independently recommended the painted bike lane on the roadway as essential to improving the neighborhood’s cycling infrastructure and extending it into Dyker Heights. The parkway, which is the equivalent of 75th Street as it runs from Bay Ridge’s Shore Road to Bensonhurst’s Bay Parkway, currently has extra-wide parking and travel lanes and could accommodate a painted bike lane with no impact on car storage or travel, according to plans drafted by the DOT [PDF]. But there was little talk of a true protected bike lane, a proven safety measure for a roadway where 142 motorists, pedestrians and cyclists have been reported injured since January, 2017, according to city stats. Local cyclists focused on “what was realistic,” said Bike South Brooklyn! activist Brian Hedden. “There are only a few streets wide enough to not affect parking, and [Bay Ridge Parkway] is one of them,” he added. There have been 142 reported injuries along Bay Ridge Parkway since January, 2017. Those very conditions remain unchanged from 2010, when a similar proposal was shot down by a coalition of CB members and politicians, including then-Council Members Vincent Gentile and Domenic Recchia, who described the 50-foot wide two-lane boulevard as a “narrow street.” The lane was killed again in 2011. Maybe third time’s the charm? This call to action may have been the reason the second group didn’t recommend Bay Ridge Parkway either: after nearly an hour and a half of mapping and discussion with DOT facilitators, the group of nine residents failed to recommend any cycling infrastructure whatsoever. Mary, a resident who was part of that fruitless discussion, explained that much of the group’s time was spent arguing about whether cyclists paid taxes or not, and whether cyclists were more dangerous than drivers. On Jan. 14, two days before the workshop, Bay Ridge and Dyker Heights’s 68th Precinct had 17 car crashes within a single day — not that the road violence persuaded people at Mary’s table. However, according to a majority of those interviewed, the workshop was a positive experience, and turnout was high. Former Community Board 10 member Bob Cassara admitted that the local community board has long been part of the problem. Cassara has long claimed that he was denied reappointment to the board because he strongly advocated for the Bay Ridge Parkway bike lane in 2010. In addition to the Bay Ridge Parkway route, other tables suggested an extension of the Fourth Avenue bike lane from its current terminus at 65th Street down to the Verrazzano Bridge; along 86th Street, a major east-west corridor; and a “bike superhighway” up the center of Third Avenue under the Gowanus Expressway. The group representing CB10 members proposed a one-way route east along 83rd Street and continuing along 81st Street in Dyker Heights. That table placed the westward return lane 13 blocks north at 67th Street. In true South Brooklyn fashion, the majority of groups ended up planning bike routes that would take cyclists directly to L&B Spumoni Gardens, a noted neighborhood pizza landmark. The DOT will return to the neighborhood this spring to reveal a new plan based on the feedback. Applications for Brooklyn Community Boards are open until Feb. 15. Apply here. …and by keeping it mortally dangerous to bicycle (or walk) on our roads, we plan to keep it that way! It’s at the point where I actually wish I believed that there was some sort of actual “car lobby” that was bribing these people, because at least that would be a comprehensible motivation. But it really does just seem to be knee-jerk defense of the status quo, no matter how awful and deadly. One of the first statements from the group of naysayers was that they saw no need to expand the bike lane network in Bay Ridge. A ridiculous statement on it’s face. Most of the groups wanted a protected lane on Bay Ridge Parkway and on 4th Avenue. The current composition of CB 10 does not represent the whole community. The politicians that choose the board members should realize the neighborhood is changing. If they continue to appoint anti-bike people to the board they can expect active opposition the next time they are up for election. Bike lanes that are bike lanes in name only but don’t provide any protection or do anything to extend the accessibility of cycling to more segments of the population, you say? Whoopi Goldberg would be proud! I wish this would happen: I wish Borough Presidents and City Council members who appoint anti-bike and anti-street safety people to the community boards would loose their re-election bids. Unfortunately, many people have no idea that “community” boards (aka political appointee boards) exist and have no idea that those boards prevent their neighborhoods from receiving road improvements. De Blasio should show some leadership and tell the DOT to do what is right for the bike lane network and what is right for safety and traffic calming, and tell the DOT to treat the “community” boards as the advisory-only bodies that they are. If you build it (high quality bike lanes), they (bicyclists) will come! 11 years left to avert a climate catastrophe and the city is still planning its bicycle network like it’s 2010. An in-the-door-zone perfect-for-double-parking bike lane is planning for 1970.